“Trail mix” is a general term that is essentially anything you’re bringing with you while you hike. There are lots of commercial varieties of trail mix, but a lot of them are more candy than healthy treat. In addition, the price per pound of store bought mix is fairly hefty. You can save a lot of money and make a healthier version of trail mix if you make it yourself. For the best savings, try to buy ingredients in bulk, although you’ll still save money on trail mix with standard size ingredient packages. The next thing to do is consider what you actually like in your mix. When you buy commercial varieties, for the most part you’re stuck with what they give you. You usually end up eating fattening ingredients you would never have put in there yourself, or you throw away and waste ingredients you dislike. So really think about the ingredients listed below and decide if you want them in your trail mix. Peanuts are not really nuts, so if you do have a nut allergy, you may still be able to eat peanuts. On the other hand, if you have a peanut allergy specifically, you might want to avoid all nuts in your trail mix, since many of the manufacturing facilities that process nuts, also process peanuts. If you want to have cashews in your trail mix, toast them lightly before adding them in. Raw cashews contain urushiol, which is the same chemical that causes severe itching from poison ivy. Since you hike, I don’t need to tell you twice to avoid urushiol. There is some debate about the issues with raw cashews, but it only takes a minute to toast raw cashews on a dry cast iron skillet at 350 degrees in the oven, so why not do it? Slivered almonds make the best shape and size for inclusion in your trail mix, but it’s extremely time consuming to sliver whole almonds without a special tool. (Trust me, I’ve done it.) It’s worth it to pay a little extra for processed slivered almonds for your trail mix. Alternatively, you could take whole blanched almonds and just chop them gently with a mallet. The shapes won’t be consistent, but if that’s not a concern, go for it. 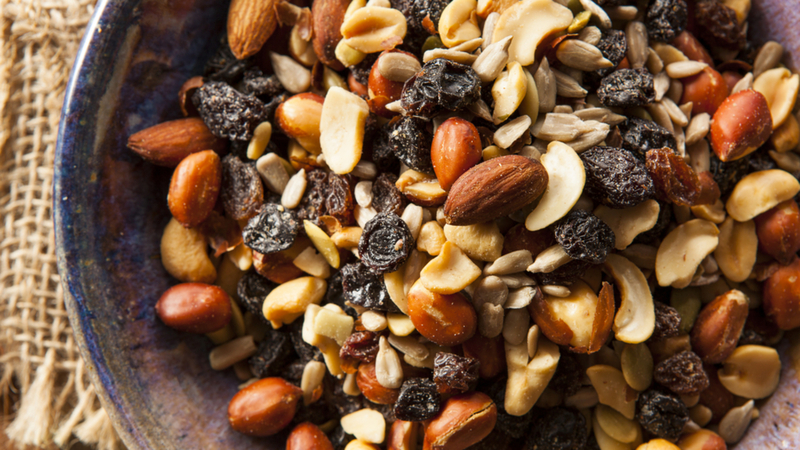 Raisins or Craisins are a great addition to homemade trail mix. They add sweetness and moisture. To keep your raisins or Craisins from sticking together, toss them in a separate bowl with a tablespoon or so of ground flax seed. The flax will coat the raisins and Craisins so they are more evenly distributed inside your trail mix bag. Besides raisins and Craisins, you can get dried peaches, plums, mangos, apricots and more. Most of the time, these dried fruits are too big to go straight into your trail mix. You’ll have to chop them into smaller bits so they conform better to the other ingredient sizes in your trail mix. M&Ms sure are tasty, but that colored coating is loaded with artificial dyes. If that’s a concern, opt for natural chocolate. Since the word on chocolate lately is that a little bit is good for you, there are many more options for dark and white chocolate that is short of being bitter, without being cloyingly sweet. Just break the bar of chocolate up with a chef’s knife to create bite sized pieces to add to your trail mix. Once you have all your ingredients selected from the list above, get out a huge bowl, and add the items. Use a wooden spoon to mix them all up. (Don’t use your hands because you don’t want to add germs to the mix. Wheat germ is okay. Hand germ is not.) Store in plastic bags or sealed glass or plastic jars. Nuts stay fresh longer in the refrigerator, so if you make a big batch, avoid storing your trail mix in the cupboard where it may go rancid. Label the containers and lace up your hiking boots, because now you’re ready to hit the trail!